The last time I truly enjoyed Chinese hotpot was three years ago on Baniyas Road. Despite its worn walls and tired décor, Xiao Wei Yang assures the sort of eccentric experience that has made it a widely known ‘secret’ for anyone in the city with an adventurous palette and restlessly hungry soul (and patience to hunt down a parking spot in the oversubscribed lots). To be honest, the excitement of dunking everything from mushrooms to crabs into a fondue-like pot was so immense that I can’t quite remember how the broth tasted back then. I do know that the broths I’ve tasted at similar hotpot restaurants in International City were nothing spectacular enough to write about. 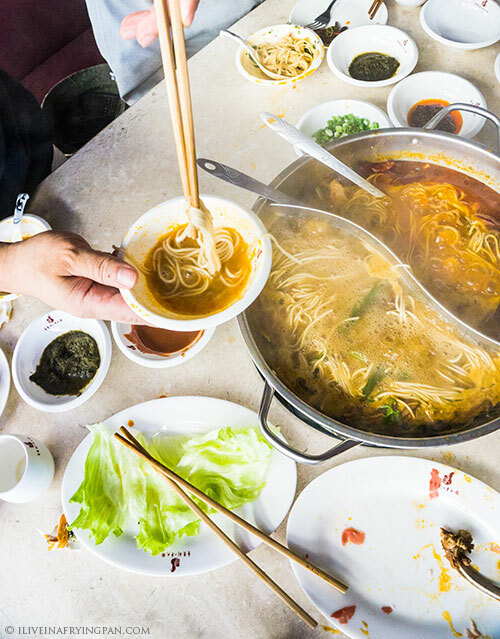 Over time, without a strong savoury recollection, hotpot faded off my food radar. 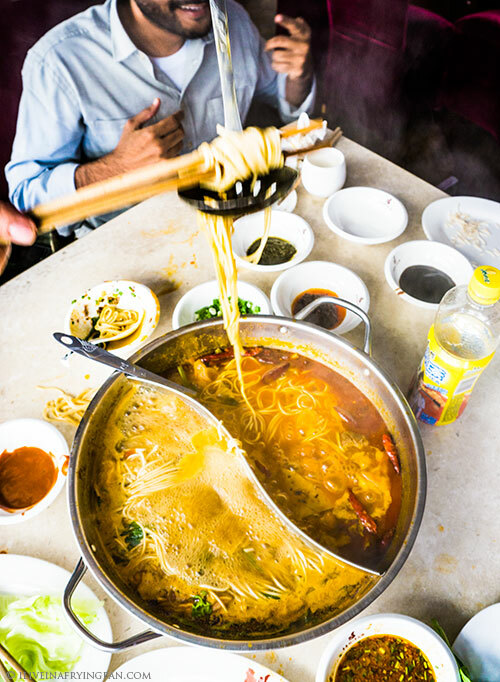 The place that has made this simmering communal soup bowl bleep back on my screen is Chongqing Liuyishou. 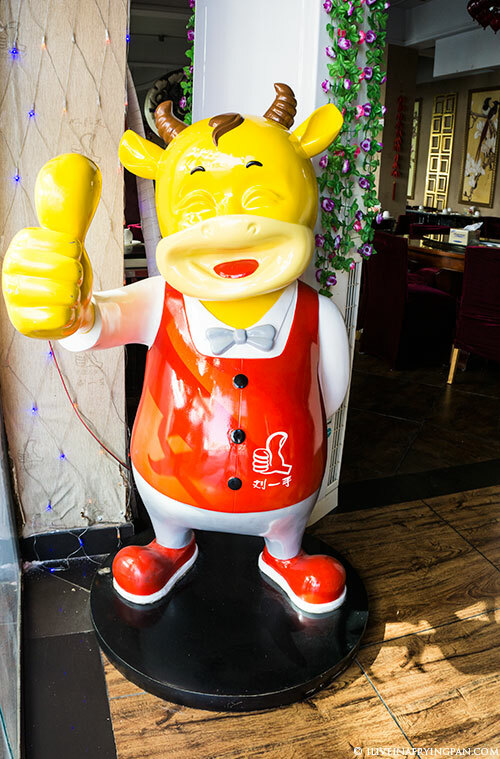 This unpronounceably-named restaurant is in a league of its own, as should be any place that ditches the eerie rocking cat for a happy cow-faced goat boasting an oversized thumb. And no eyeballs. It’s these kinds of places that restore my faith in the quirky eccentricities of Old Dubai. 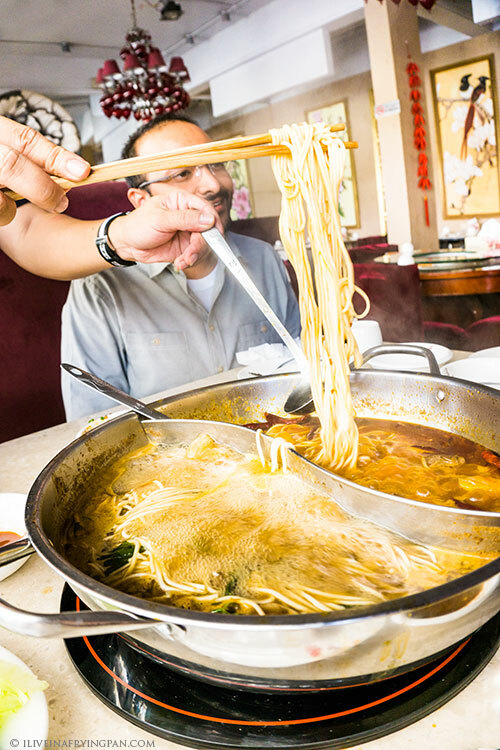 Three things make this place my new hotpot favourite, over and above Xiao Wei Yang. Firstly, they have a really clued-on Bangladeshi server called Awal who takes a personal interest in helping you decipher the hotpot menu. 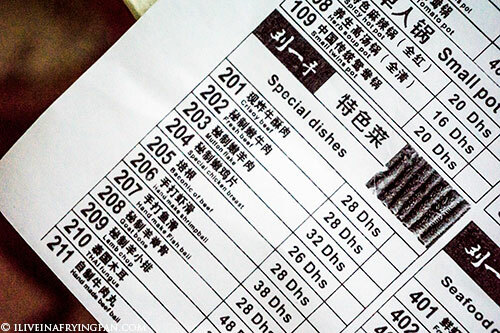 This is really critical if you have no idea what you’re doing when faced with the menu ordering form full of things like Thai Fungus and Baconic of Beef. Don’t worry, we’ve all been there. And it helps when you have someone like Awal to walk you through the exotic details. Awal not only walks you through the menu, but he blesses your spice selection based on your nationality (‘you’re Filipino? Can't do spice, only mild! You – you’re Indian, you can do spicy.’), pre-empts any menu misconceptions especially if you’re cluelessly trying to match dishes to photos (‘you picked this dish because you thought it was the same as this picture?' Golly yes, how did you know? 'I know, but it's not the same dish. THIS is the one you want.’) and is your lifeguard when you drown in the variety of dipping sauces (‘You took every sauce in a separate bowl?!? No, you can’t enjoy it like that.’ Seriously Awal, I prefer it that way. ‘Fine. But you won't enjoy it. Come, I will show you.’ And true enough, the combined sesame and mushroom sauce he created for me will forever be my go-to dipping sauce recipe.) If you’re a hotpot noob, you’ll be hugging Awal like a doe-eyed hotpot graduate by the time you step out of the door. 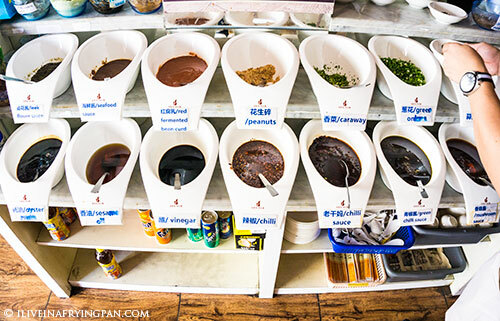 The second reason why Chongqing scores top marks in the hotpot category is because their dipping sauces are well-ordered and stacked up in a way that doesn’t feel scary and foreign and wiggling with frog legs if you know what I mean. 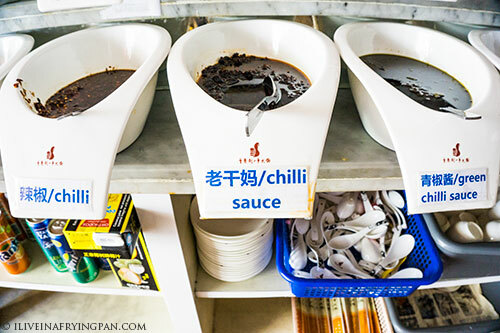 Not like any dipping sauce display in any hotpot restaurant I’ve seen has squirmy stuff in the sauces, but it helps when the restaurant goes an extra mile to make things look pretty and well-labelled. Because you can never have enough chilli. 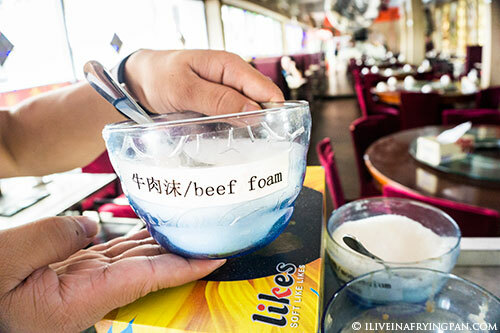 Beef Foam served atop Soft Like Likes, obviously. 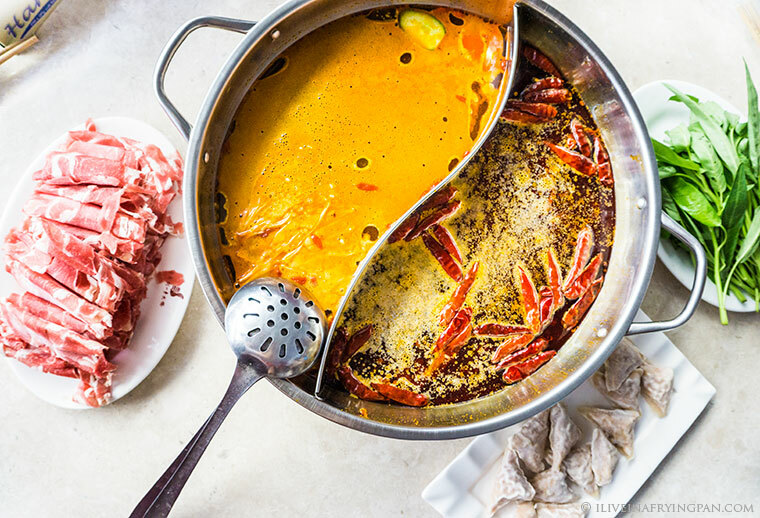 But the main and most important reason why this hotpot restaurant is one that I’ll be returning in the winter (which is actually when you’re supposed to eat hotpot – not in the 50 degree afternoon heat that I chose for my food jaunt) is because their broth is special. Really special. You simply can’t sidestep the flavour. We picked #106 on the menu aptly called 'Appetizing Tomato Pot' – a dual twin pot with a tomato broth on one side and a ‘mildly’ spicy broth on the other. 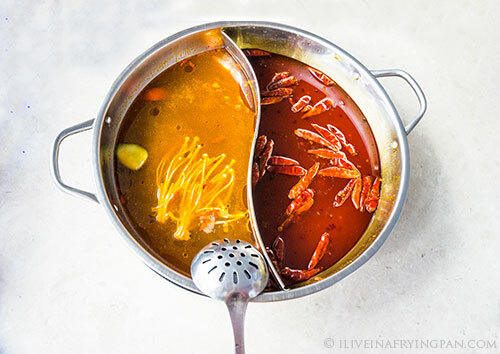 Both types of broth spoke of a simmering stock process that had executed the right balance across its seasonings – ginger, garlic, pepper, whoever knows what else (in the wise words of Jerry who lent his tummy for this lunch: when in a Chinese restaurant, don’t ask too many questions.) The tomato broth played out like a perfectly synchronized composition, one where even the keenest of tasters would find it challenging to single out any one flavour from the well-orchestrated, harmonious whole. The spicy broth was fantastic, less because I can handle spice (I can’t) but more because of the type of chillies used. When you sip the soup, the spice travels like a prickly steamroller from the tip of your tongue, towards the sides, then to the back. And just when you think it’s all done and dusted, the steamroller goes barging backwards and stuns your ears with a scarily unexpected spice shock. This happens only on the first sip. Every spoonful after that just adds to the fiery burn that has now erupted all across your face. Mind you, this was the mildly spicy broth. 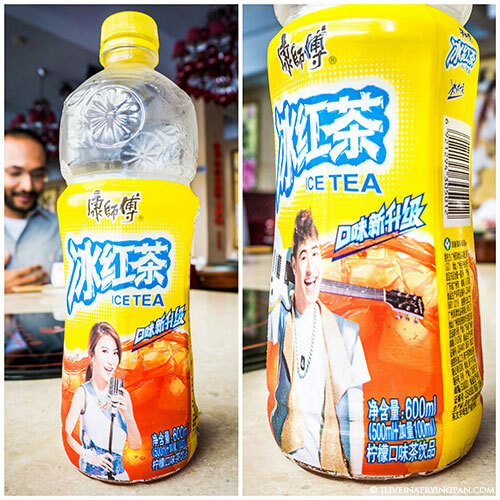 If you do plan to inflict the spicy broth on yourself, I’d recommend grabbing a Chinese iced tea to reward yourself. It tastes of some sweet combination of apples and faint mango and is monumentally more exciting in its packaging than Coke or Pepsi will ever be. When in China, be a Rockstar. Next time I’ll ask them if I can have an egg to dunk in towards the end. I’ve read that it’s tradition and a runny egg with noodles seems right up my experimental alley, along with a couple of other tantalizing items like glutinous rice sesame balls, deep-fried dough sticks (a universal culinary protocol) and baconic of beef. 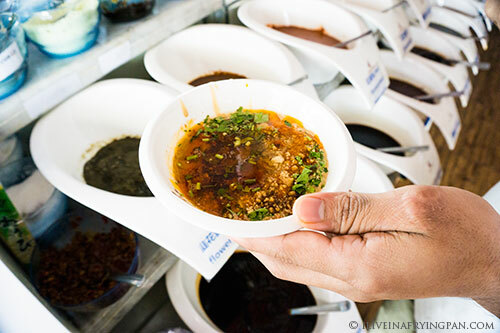 If Awal isn’t around to concoct the sweet sesame sauce for you, here’s the recipe: sesame sauce, mushroom sauce, soy sauce, vinegar, scallions, coriander, sesame oil. Or try something spicier if you dare. Near Fish Roundabout behind Al Ghurair. If you have Al Ghurair to your right as you drive down towards Fish Roundabout, take a u-turn from the roundabout and park in the open parking on the right (i.e. across the street from Al Ghurair). Walk back towards the main road with Fish Roundabout, take a left heading into Naif and walk down the road. Take the second left and the restaurant will be to your right. DO NOT try to brave the parking situation in this area, your car is best left in the open parking lot. And for God’s sake, carry a smartphone equipped with Google maps and the link to the restaurant location pre-loaded in. Here's my Google Map of hideouts with the restaurant location pinned to it. ← Older: Finally, more pocket-friendly ways to fix that Thai Curry craving. Can’t wait to tell my husband about this place! He’s been raving about hot pots ever since he spent some time in China, and keeps on wanting to take me to try a real authentic version. This is right up his alley! You did it for us with the Little Bangkok review and I’m sure you will again with this place coz we’re definitely giving it a visit! Awesome to hear that Little Bangkok was a hit Nabeela! Let me know what you both think once you and hubs have tried the hot pot at this place. Mouth watering since I like spices – have so many places to explore that you have written about and guess will take me a year to cover even if I do two a week. Well written article and photo’s are tempting and nice. Don’t worry dad, I’ll catch you up on all the places you’ve still to try. But I must take you for the spicy hotpot soon, you can finally meet your fiery match! Oh the wonders of great servers! I wish that all restaurants, big or hole in the wall, have people as knowledgeable and helpful as Awal. Amen to that wish Didi, amen. You just always surprise me with these little gems that you discover time and again. Currently in the midst of making a big long list of joints to visit in Deira in Dec. Can you suggest a food walk as well? More intrigued by the Arabian walk. Hi Delnavaz! 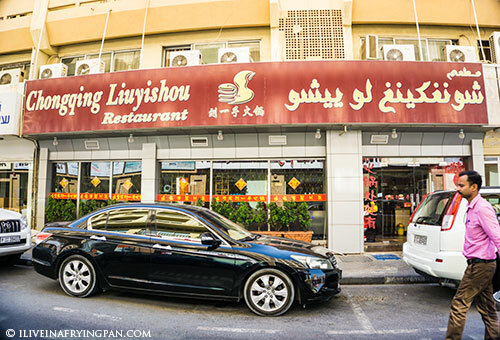 Thanks for the blog love :) A Deira list sounds like a monumental but mouthwatering task…it’s like a bottomless pitcher of quirky eateries in this area. 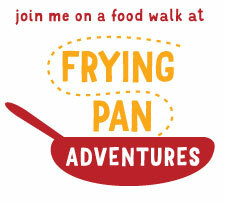 Would love to see you on the food trails, drop us a line through our website at http://www.fryingpanadventures.com and we can advise you on the best trail to worship your tummy ;) The Middle Eastern one is the most comprehensive and intense one to try! I love me my spices, so this is a perfect place to visit! Delicious and full of awesome flavour! Your photos are so enticing! Thank you so much for this recommendation. My husband and I are in Dubai (from India) for work for a month and a half and have been on the lookout for places just like these. We started the past weekend with a hotpot at this gem of a place. Everything encluding the servers at this joint are A+. Our first hotpot experience. We are definitely going back here. My pleasure Himani! Impressed that you’re new to town and still venturing out to find places in the labyrinth that is Naif ;) Glad to hear you had a top-notch experience! All your posts make me hungry – but this one makes me want to grab KP’s hand and run there right now. We better just check that Awal is on duty! I don’t know what to say. One of the best photographs that I have come across in your blog. Devastatingly tempting. Great recommendation. enjoyed it when I was there but grossly underestimated the spice level of the spicy broth…. Ended up with severe fallback from indulging the spicy broth and took a day to recover. Thank you to make this all about me & my restaurant. it’s been pleusare to meet with you people. in future I’ll do better.